There is a reason why millions of people visit Barcelona every year. The city offers a different adventure for every traveller. Whether you want to marvel at its glorious architecture, take a deep dive into its rich history, try all the delicious food and wine, or simply lounge on its beautiful beaches – there is no limit to the things you can do while visiting Barcelona, even while on a budget! How to Enjoy Madrid Without Going Broke! 72hrs in Amsterdam … on a Budget! There are 3 excellent options for getting transportation tickets at cheap prices; each come with their own added benefit. While it is totally possible to purchase individual tickets each time you need to take public transportation, the city has come up with this wonderful option to save some money during your stay. The T10 Transport Ticket lets you purchase 10 trips for a total of €10 (essentially €1 per trip). The price of a single ticket is €2.20, so for 10 individual tickets, it would be double the price of the T10. You can use this ticket on any journeys made on metro or bus. Drawback: airport transfers are not included and would have to be paid for separately. This amazing card gives you the option of unlimited travel for a daily price of €7.60, though the minimum purchase you can make is for 2 days/48 hours. This is a great option for travellers that will be going from place to place using not only the metro and bus, but also the urban railway, TRAM and even the regional railway. The best part is that your trip from the airport is also covered. Bonus: you can receive an additional 10% discount if you purchase online. If you decide to go this route, the company will email you a voucher which you need to bring to any metro station to receive the actual Hola BCN card. This card is for the serious travellers looking to not only go from place to place, but also see as many museums and exhibitions as possible. 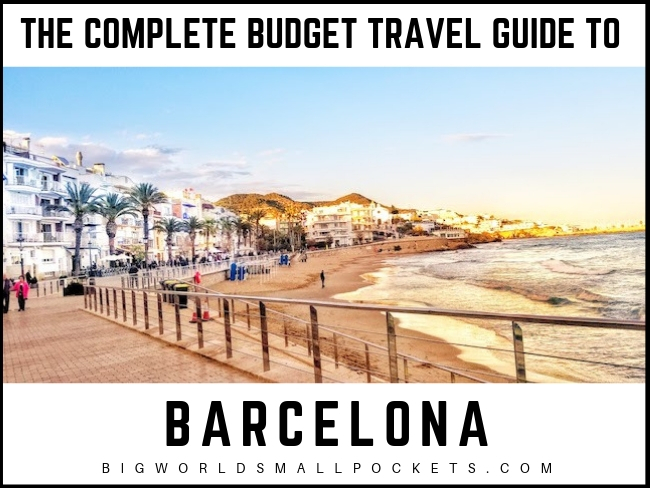 Some of the benefits of this card include free transportation, free entry to the majority of Barcelona’s museums, options to skip the line at popular sites, plus tons of deals and discounts on tours, shopping and dining. It also comes with a map and city guide (and its own set of coupons that you can use in addition to the other discounts). The card can be purchased in increments of 3, 4, or 5 days and prices range from €46-€61 – which, once broken down, is about €12-€15 per day! There are discounted rates available for kids. Drawback: La Sagrada Familia and Park Guel are not included in this offer. They do, however, offer a Gaudi bundle that gets you access to both with the option to skip the line and an audio guide. A small place known for its delicious tapas and fresh seafood. Prices are great and the atmosphere is extremely friendly. Come here for some of the best patatas bravas, grilled peppers and fried octopus in Barcelona. My favorite Mexican restaurant located in the trendy Born area. They have a great selection of beer and of course – tequila! Some of their specialities include tacos and homemade guacamole. Be sure to make a reservation before going as it gets packed, especially on the weekends. No Barcelona food post is complete without this incredible burger joint. Available at various locations within the city, Bacoa features delicious homemade burgers that you can customize to your liking. Newly added to the list: veggie and vegan options! Wherever in the world I’m heading I always make sure I’m well covered and highly recommend travel insurance from World Nomads, which I’ve used during my time in Europe and beyond, due to their easy claims process and excellent policy coverage. Located right in the center of La Rambla (Barcelona’s most famous street), La Boqueria Mercat is a large market that sells the freshest seafood, fruit and vegetables daily. It is always jam-packed with people, but definitely worth walking through – if only just to see what is being offered that day. The tours generally last 2-3 hours and are completely free – you just have to give your guide a tip at the end. The meeting point is at Placa del Angel in a small square near the metro station. You will recognize the guide by what they are wearing. Top Tip: Sandeman’s also offers a fun paid tour that I took the last time I visited the city. For €20 you get a tapas bar crawl that takes you to 4 bars where you can try wine or craft beer and various tapas at each location. For an additional €15, you can see a Flamenco show! I did it all for the €35 bundle and can honestly tell you, it’s so entertaining and totally worth it. Las Arenas was once a bullring that was turned into a huge shopping centre with 5 floors of stores, restaurants, a movie theatre and a magnificent rooftop outdoor terrace area. While you can stroll through all the various stores, the showstopper is the rooftop area. You can essentially walk the entire length of the structure in a circle while seeing the centre of Barcelona. The sight is absolutely breathtaking. Pro Traveller Tip: There is an elevator outside of the shopping centre that charges you €1 to head up to the terrace. Don’t do it! Just go inside the mall, take the elevator up to the 4th floor and ride a small escalator up to the terrace (there is no direct elevator for this floor). You will be able to get up there without having to pay the fee. Take advantage of the fact that museums are free after 3pm on Sundays (or all day the first Sunday of the month) to see your favourite exhibits. Keep in mind that many people also wait until Sunday afternoon to head to museums for this reason, so plan accordingly. My absolute favorite is the Design Museum’s fashion exhibition showing the history of fashion and how it has evolved from 1550 to today. If you’re lucky to be visiting Barcelona between April 1st and October 31st, you’re in for an unforgettable treat. 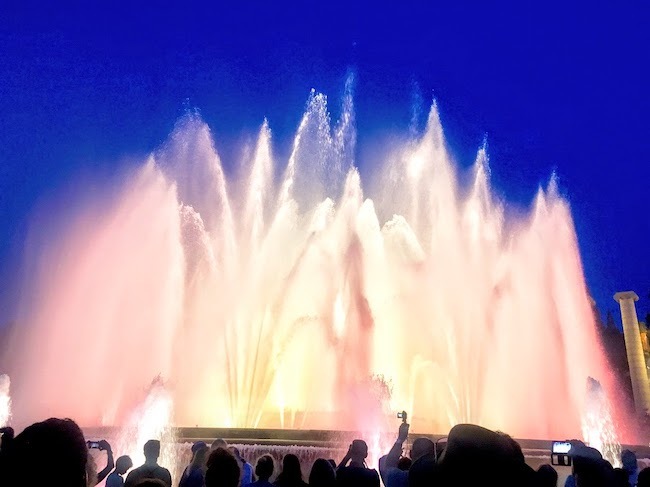 Each year, the city puts on an incredible show with the water fountains at the Montjuic Palace. The fountains are larger than life, turn into different colours and play music that they move along to. It’s breathtaking to see in person and while it gets very packed with people, it is so worth it. Head there early for a good spot, even though you can really see it from anywhere – especially from the top of Las Arenas! During the summer months, there is also a fireworks spectacle that starts at 9pm Thursdays-Sundays. It’s always interesting to see variations of this monument in different parts of the world. In Barcelona, it is right in the centre of the city, steps from the Gothic Quarter. Built as the gateway to the Universal Exhibition in 1888, the Arc was used as a symbol of welcoming to the various nations that attended this groundbreaking fair. On the weekends, there are always small events and festivals that take over the entire area, so be sure to check local event listings when you visit. At the lower end of La Rambla, you’ll find this impressive monument dedicated to Columbus’ first voyage to the Americas. The best thing about this part of the city, also known as Port Vell, is that it is right on the water and makes for some incredible pictures! Additionally, you’ll get to see many of the street performers in this area of La Rambla, which are always interesting to watch. Finally, at the end of the port, you’ll see an enormous shopping centre that literally looks like it is floating on the water. This is the Maremagnum Center, home to some of Barcelona’s most popular stores. There are also boat rides and sky rides available for tours with their ticket offices located directly on the port. AirBnb can be a great option for grabbing a great accommodation deal in expensive cities like Barcelona, especially if you’re travelling as a couple, family or group. Get £30 off your AirBnB booking by clicking HERE! If there is one place I recommend you don’t miss on your trip to Barcelona, it’s this. 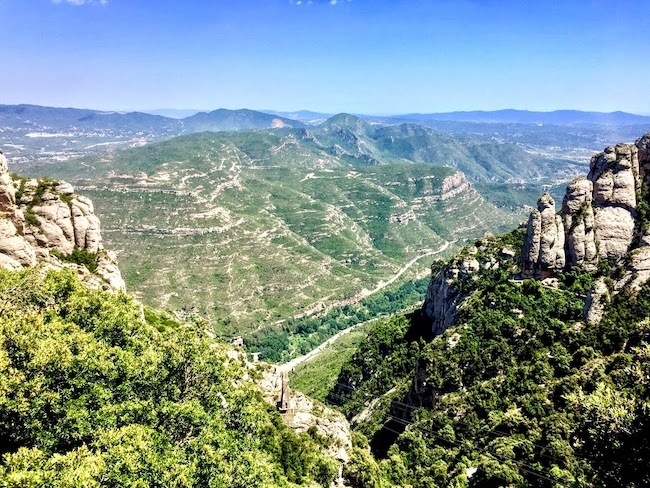 An hour from the centre of the city, Montserrat is a jagged mountain that has breathtaking views at the top as well as an Abbey and a Monastery. The Good News: entrance to the Monastery is free. However, you have to pay for your transportation as it is not included in any of the city cards. Getting to Montserrat is simple but has a few steps to it. 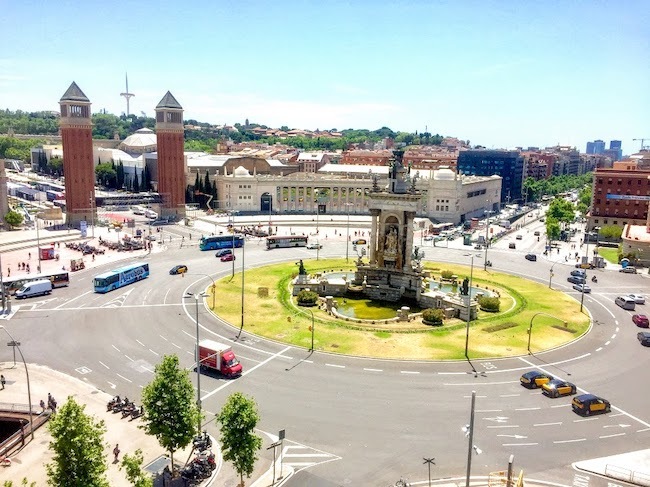 First, you need to get to Placa Espanya (the entrance to the station is literally across the street from Las Arenas/the bullring-turned-shopping center mentioned above). From there, look for signs to the R5 track. The station is quite large, so it may be a bit of a walk. Once you’re there, you’ll see machines with signs that say ‘Montserrat’. From here, you have 2 options when it comes to purchasing tickets. You can either select to ride up to the mountain on a cable car or a funicular. Once you purchase your tickets, a train takes you up to the base of the mountain; this ride takes about an hour. From there, you go up to the monastery on either choice you made earlier (funicular or cable car). Cable car gets you there a bit faster and more comfortably while the funicular has absolutely incredible views as you head up literally hanging on a cable. Return tickets up to the monastery are about €22. Pro Tip: Bring your own lunch to save money as the restaurants at the top are expensive. A mere €4 train ride will get you to this historic beach city in 45 minutes from Barcelona’s Estacion Francia (France Station). Known for its beautiful beaches, LGBT-friendly community and world-renowned film festivals, Sitges is the perfect day trip to take that won’t break the bank. Walking through the small cobblestone streets and rows of colourful houses, you can see firsthand just how much history the city still holds. Another thing Sitges is famous for: being the birthplace of Facundo Bacardi AKA the creator of the wonderful rum we enjoy today. There is a fantastic tour through the Casa Bacardi that I highly recommend. €10 will get you Bacardi’s full history, a walk through the entire house, samples of various versions of the liquor as well as a mixology lesson with a Bacardi specialist where you will make 3 drinks that you can enjoy afterwards. The highest point in all of Barcelona, Tibidabo is another can’t-miss experience while visiting this city. 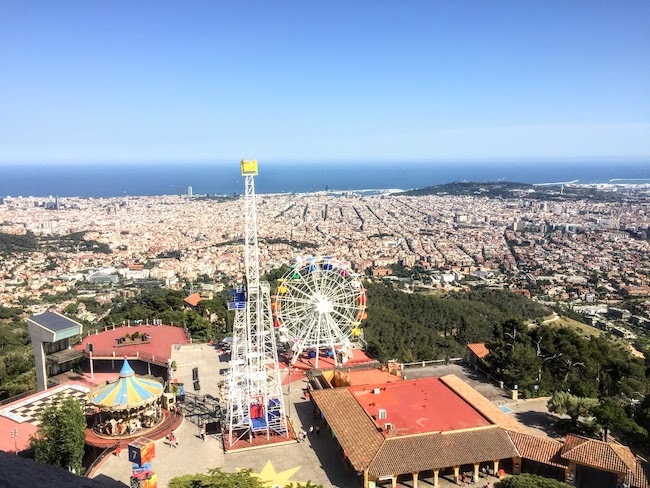 To get to the top, you need to take a funicular up but you can first take a train up to Avinguda Tibidabo and walk to the funicular from there. Be Warned: it’s a steep walk as many of the streets are very inclined. The funicular ride is available every 30 minutes and is €7.70 for a return trip. Note: in February, the funicular only runs on a very limited weekend schedule, while March-December it runs every day. Once you’re at the top, be prepared to be blown away. There is an amusement park as well as a beautiful church, Sagrat Cor, with a figure of Christ at the top which is said to be larger than the Christ the Redeemer statue in Brazil. For another €3, you can climb to the very top of the church. Being a lover of heights I, of course, paid the extra fee and made the climb up. Am I glad I did – the views of Barcelona from here are absolutely spectacular. 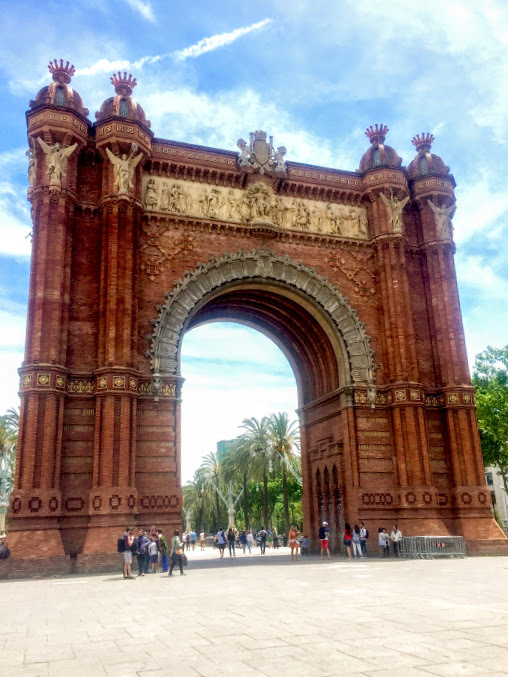 There are so many incredible things to see and do in Barcelona. Maria Hedian is the founder and author of Em Around the World, a site dedicated to simplifying travel for aspiring budget solo travelers. She loves finding great deals, tasty Mexican food and fashion exhibits no matter where she travels to in the world.